Want to be notified of new releases in esprfid/esp-rfid? Access Control system using a cheap MFRC522, PN532 RFID, RDM6300 readers or Wiegand RFID readers and Espressif's ESP8266 Microcontroller. Small size form factor, sometimes it is possible to glue it into existing readers. What are others saying about esp-rfid? This project still in its development phase. New features (and also bugs) are introduced often and some functions may become deprecated. Please feel free to comment or give feedback. Get the latest release from here. See Known Issues before starting right away. See Security for your safety. Download compiled binaries from GitHub Releases page https://github.com/esprfid/esp-rfid/releases On Windows you can use "flash.bat", it will ask you which COM port that ESP is connected and then flashes it. You can use any flashing tool and do the flashing manually. The flashing process itself has been described at numerous places on Internet. When you run platformio run for the first time, it will download the toolchains and all necessary libraries automatically. The resulting (built) image(s) can be found in the directory /bin created during the build process. You can not simply edit Web UI files because you will need to convert them to C arrays, which can be done automatically by a gulp script that can be found in tools directory or you can use compiled executables at the same directory as well (for Windows PCs only). Gulp script also minifies HTML and JS files and compresses (gzip) them. In order to test your changes without flashing the firmware you can launch websocket emulator which is included in tools directory. You will need to Node JS for websocket emulator. chrome.exe --args --disable-web-security -–allow-file-access-from-files --user-data-dir="C:\Users\USERNAME"
Open your browser and type either "http://192.168.4.1" or "http://esp-rfid.local" (.local needs Bonjour installed on your computer) on address bar. Log on to ESP, default password is "admin"
Configure your amazing access control device. Push "Scan" button to join your wireless network, configure RFID hardware, Relay Module. Save settings, when rebooted your ESP will try to join your wireless network. Scan a PICC (RFID Tag) then it should glimpse on your Browser's screen. Type "User Name" or "Label" for the PICC you scanned. Congratulations, everything went well, if you encounter any issue feel free to ask help on GitHub. Please also check GitHub issues. We are syncing time from a NTP Server (in Client -aka infrastructure- Mode). This will require ESP to have an Internet connection. Additionally your ESP can also work without Internet connection too (Access Point -aka Ad-Hoc- Mode), without giving up functionality. This will require you to do syncing manually. ESP can store and hold time for you approximately 51 days without a major issue, device time can drift from actual time depending on usage, temperature, etc. So you have to login to settings page and sync it in a timely fashion. We assume ESP-RFID project -as a whole- does not offer strong security. There are PICCs available that their UID (Unique Identification Numbers) can be set manually (Currently esp-rfid relies only UID to identify its users). Also there may be a bug in the code that may result free access to your belongings. And also, like every other network connected device esp-rfid is vulnerable to many attacks including Man-in-the-middle, Brute-force, etc. This is a simple, hobby grade project, do not use it where strong security is needed. We are working on more secure ways to Authenticate RFID Tags. Since we are limited on both flash and ram size things may get ugly at some point in the future. You can find out some test results below. 1) How many RFID Tag can be handled? each have "access type" 1 byte integer "1" or "0". 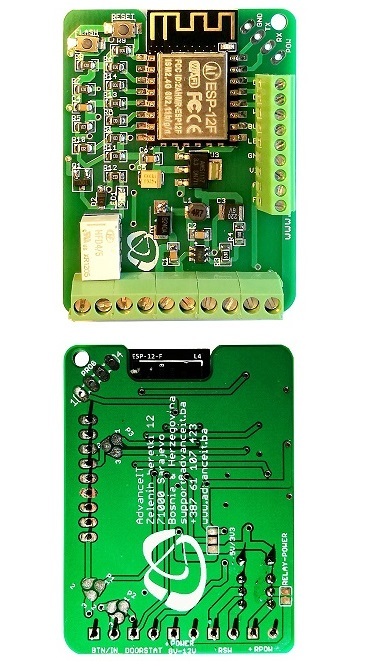 At least 1000 unique User (RFID Tag) can be handled, the test were performed on WeMos D1 mini. Logging needs testing. How long should it need to log access? What if a Boss needs whole year log? Reliability on Flash (these NOR Flash have limited write cycle on their cells). It depends on manufacturer choice of Flash Chip and usage. The code parts written by ESP-RFID project's authors are licensed under MIT License, 3rd party libraries that are used by this project are licensed under different license schemes, please check them out as well.